The Herberth Motorsport Porsche 911 GT3 R (#911, Daniel Allemann / Ralf Bohn / Matt Campbell / Alfred Renauer) has won the 20th running of the Hankook 24H BARCELONA, taking its second outright victory of the 2018 24H SERIES powered by Hankook in the process. 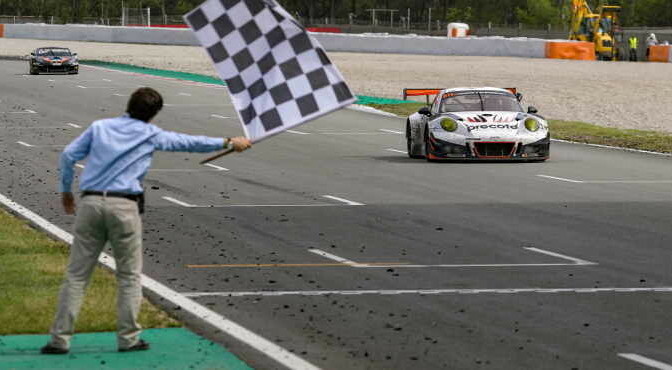 Daniel Allemann took the #911 Porsche across the finish line to complete 677 laps of the 4.655km Circuit de Barcelona-Catalunya, the highest number achieved at the event since its re-introduction in 2011. Just three minutes separated the lead Porsche from the 2nd-placed Bohemia Energy racing with Scuderia Praha Ferrari 488 GT3 (#11, Jiří Písařík / Josef Kral / Matteo Malucelli) after 24 consecutive hours of racing in Northern Spain. The Czech-run Ferrari had established a healthy lead as the race went into the night stages, and even led more laps – 377 versus 208 – to the outright winner, but ultimately fell foul of both a short Code 60 caution period shortly before dawn and brake issues. The time lost on pit road allowed Herberth Motorsport to leap ahead, despite the #911 Porsche starting 9th on the grid. The ROFGO Racing Mercedes-AMG GT3 (#31, Roald Goethe / Stuart Hall / Daniel Brown / Thomas Jaeger) was another A6-Pro entrant to lead the field outright, and had looked set to finish on the outright podium. The British team would ultimately drop out of the top 10 though with just one hour of the race left to run, a mishap that elevated the IDEC SPORT RACING Mercedes-AMG GT3 (#17, Patrice Lafargue / Marvin Klein / Dimitri Enjalbert) into the outright top three in the closing stages. Despite losing time to a brake issue in the re-fuelling station, the PROsport Performance Mercedes-AMG GT3 (#85, Charles Putman / Charles Espenlaub / Joe Foster / Adam Christodoulou) takes its third consecutive A6-Am class win on the bounce in Barcelona , and thus keeps its European Championship hopes alive going into the title decider at Spa-Francorchamps next month. Having nursed a broken front splitter to the finish, the Mercedes-AMG GT3 of reigning GT champions Hofor-Racing Mercedes-AMG GT3 (#1 Michael Kroll / Chantal Prinz / Roland Eggimann / Kenneth Heyer / Christiaan Frankenhout) finished 5th on the road, just ahead of the Car Collection Motorsport Audi R8 LMS (#34, Johannes Dr. Kirchhoff / Gustav Edelhoff / Elmar Grimm / Ingo Vogler / Max Edelhoff). The pair complete the A6-Am podium in the process, while the sister #33 Car Collection Motorsport Audi (Ali Çapan / Stefan Aust / Alex Autumn / Isaac Tutumlu Lopez / Ivan Pareras) completes the outright top 10 after a race-long recovery drive. Impressively, two SPX entries finished in the overall top 10 at Barcelona, just behind the 7th-placed Swiss Team Mercedes-AMG GT3 (#15, Joël Camathias / Mauro Calamia / Christoph Lenz / Roberto Pampanini). After a race-long battle, it was the Leipert Motorsport Lamborghini Huracán Super Trofeo (#10, Harald Schlotter / Marcus Påverud / Anthony Lambert / Morgan Haber) that pipped the True-Racing KTM X-BOW (#116, Reinhard Kofler / Laura Kraihamer / Naomi Schiff / Eike Angermayr / Klaus Angerhofer) to become the sixth different SPX class winner in this year’s 24H SERIES powered by Hankook. The second True-Racing entry (#117, Hubert Trunkenpolz / Sehdi Sarmini / Artur Chwist / Gerald Kiska / Reinhard Kofler) collected the final SPX podium. The Porsche Lorient Racing Porsche 991-I Cup (#64, Pascal Gibon / Lionel Amrouche / Frédéric Ancel) led home a team 1-2 finish at Barcelona for 991-class victory, securing the car’s first category win since last July’s Hankook 12H IMOLA. The sister #65 entry (Jean-François Demorge / Alain Demorge / Gilles Blasco / Mathieu Pontais) claims 2nd. Incredibly, despite losing more than an hour repairing a gearbox issue, the class podium was completed by QSR Racingschool (#94, Rodrigue Gillion / John Mauro / Gavin Pickering / Jim Briody / Ricky Coomber) after long-time leader EBIMOTORS (#73, Lino Curti / Carlo Curti / Marco Frezza / Federico Curti) and 991-standings leader IDEC SPORT RACING (#75, David Abramczyk / Stephane Adler / Romain Vozniak / Christophe Cresp / Frank Mechaly) both failed to make the finish. Further back in GT4, the NM Racing Team Ginetta G55 GT4 (#215, Nikolay Dmitriev / Maxime Guillemat / Lluc Ibáñez / Max Llobet / Xavier Lloveras) took class victory ahead of fellow Ginetta runners, Nova Race (#227, Luca Magnoni / Matteo Cressoni / Enrico Garbelli / Henri Kauppi). It’s the Spanish team’s second 24H SERIES win at its home circuit, and follows its outright win at last year’s Hankook 24H BARCELONA. The podium is completed by the QSR Racingschool Mercedes-AMG GT4 (#254, Mario Timmers / Bert Redant / Michiel Verhaeren / Jimmy de Breucker / Hubert Haupt), which extends its lead in the GT4 standings heading into the title decider at Spa. The CUPRA Racing – MONLAU COMPETICION CUPRA TCR (#108, Alba Cano Ramirez / Laia Sanz / Francesc Gutierrez Agüi / Jordi Gené ) takes a popular TCE win on home turf on the Spanish outfit’s return to the series. Francesc Gutierrez Agüi led the TCE field across the line after completing 621 laps of the 4.655km Circuit de Barcelona-Catalunya. Fittingly, Gutierrez’s first class win at the Hankook 24H BARCELONA since 2014 also comes 20 years after the Spaniard took his first of two outright victories at the event in 1998. The result also marks the second class win for 13-time Women’s Trial World Champion, Laia Sanz. The Baporo Motorsport Audi RS3 LMS (#133, Alberto Vescovi / Roberto Ferri / Jaime Font Casas) takes the second step of the TCE podium alongside Spanish compatriots MONLAU COMPETICION, while Red Camel-Jordans.nl SEAT Leon TCR (#303, Ivo Breukers / Monny Krant / Henry Littig / Bert de Heus / Rik Breukers) completes the TCE top three. The NKPP Racing by Bas Koeten Racing CUPRA TCR (#175, Gijs Bessem / Harry Hilders / Jan Sorensen / Kristian Jepsen) had been in contention for TCE victory, but broken front suspension meant the Imola class winners were relegated to 6th in-class at the flag. Unusually, the second Bas Koeten Racing entry – the Kawasaki Racing (#155, Joachim Bölting / JM Littman / Jean-Laurent Navarro / Pierre-Arnaud Navarro) – failed to make the finish after being withdrawn from the event with engine failure. The CWS Engineering Ginetta G55 (#178, Colin White / James May / Paul May / Steven Wells) ended a very challenging weekend to take the SP3-class win, despite persistent driveshaft problems. Victory in the early stages had looked set to go to the sister #278 G55 (Michael Jensen / Nick Adcock / Adam Hayes / Matthew Nicoll-Jones / Finlay Hutchison), but that race would end in dramatic fashion after just 40 laps when the Ginetta caught fire on-track. The runners-up spot thus went to the Munckhof Racing BMW M4 (#259, Eric van den Munckhof / Marcel van Berlo / Ted van Vliet / Marco Poland), which also held a comfortable class lead in the early hours only for the engine to expire shortly before midnight. The Hofor Racing powered by Bonk Motorsport BMW M235i Racing Cup meanwhile (#131, Martin Kroll / Michael Schrey / Michael Fischer / Bernd Küpper / Gustav Engljaehringer) claims its fifth consecutive class win of the season, though bizarrely, the team failed to make the finish owing to engine failure. Similarly, the Synchro Motorsport Honda FK8 Civic Type-R (#76, Alyn James / Daniel Wheeler / Andrew Hack) claims 2nd in A3, but the reigning 24H TCE SERIES champions would make a scary exit from the race when Andrew Hack barrel-rolled down the back straight after making contact with the EBIMOTORS Porsche. The final European Championship round of the 24H SERIES powered by Hankook will take place at Spa-Francorchamps on 12-13 October, but this will not be the final CREVENTIC event of the season as the Championship of the Continents season finale will take place at the Circuit of the Americas in Austin, Texas, on 16-17-18 November. 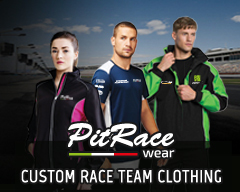 Further information on this year’s calendar can be found at www.24hseries.com.